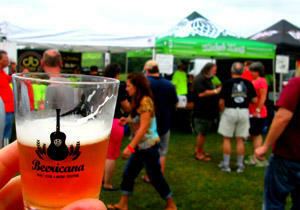 The sixth annual Beericana Craft Beer and Music Festival will take place Saturday, Oct. 12, again at Sugg Farm Park in Holly Springs! This year's festival will feature more than 70 breweries, nearly 20 food trucks and live music from N.C.-based bands Plus, we'll have another great selection of beer-centric vendors for you to check out. Mark your calendars now because you don't want to miss this year's event! It's not just about us, though, as we also give back to our community and to support craft beer in our state. A portion of the proceeds from Beericana goes to support the N.C. Craft Brewers Guild and other nonprofits.